B.R. White, director of the Oconee County Planning Department, told me late this afternoon that his office had not yet been notified by PHG of its change in plans. White said the office was to send out a notice next week to the company so it could prepare for the June 17 Planning Commission meeting. PHG announced just before the Dec. 10 Planning Commission meeting that it wanted to postpone consideration of its request and come back to the Commission in June. White said he would need to have the copy for the required legal advertisement ready for submission to The Oconee Enterprise, the county’s designated legal organ, by May 23 so it could run in the paper on May 30. PHG President Frank McElroy informed Oconee County officials in early August that PHG was reviving its plans for its Presbyterian Village project, which it first proposed in the county in 2008 on a site near Butler’s Crossing. Instead of the original site, PHG said it planned to use the undeveloped Autumn Glen subdivision across from Old Waverly subdivision and just west of the Rowan Oak residential complex for the continuing care retirement facility. PHG asked the county to change the existing zoning for the Autumn Glen property from R-1 Single-Family Residential District to R-3 Multi-Family Residential District. Because the R-3 category allows for a continuing care retirement community only as a special use, PHG also was asking for special use approval. 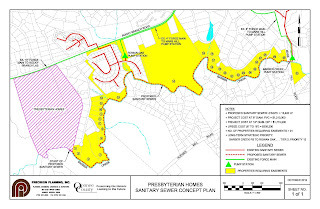 As McElroy’s letter of yesterday indicated, PHG had hoped the county would allow it install a pump station to access the county’s sewage facilities. 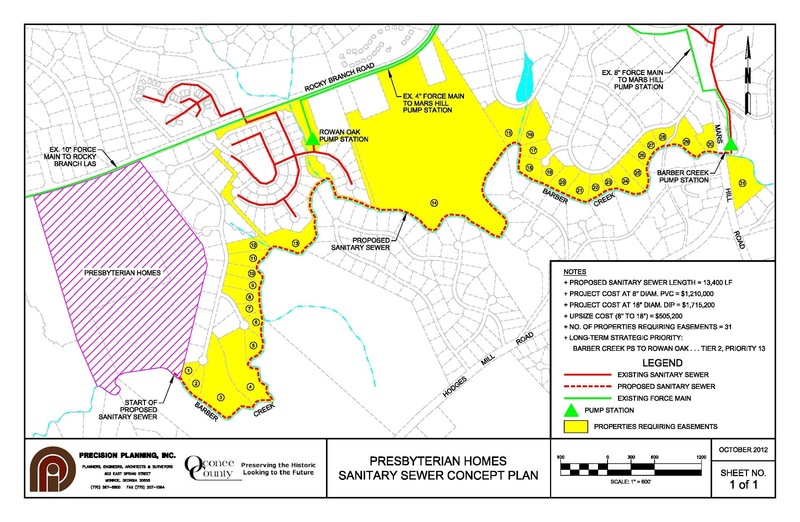 That sewer line was estimated to cost $1.2 million and would require PHG to get easements on its own from 31 property owners, some of whom have been vocal opponents of the rezone request. McElroy’s letter went out on the letterhead of the PHG Office of Development in Duluth. One person who received it today informed me of it and sent me a copy. PHG, based in Quitman, has no formal connection to the Presbyterian Church. Thank you for your consistent hard work as a citizen of Oconee County. Your efforts have encouraged many of us, who previously refrained from active community involvement, to engage with others of like mind. Your experience and willingness to serve has given our combined voices greater clarity and credibility. We expect the very best from our elected officials; however, without responsible, positive, citizen involvement mediocrity will quickly become the norm. Thank you, Gene. How very kind of you to say this.